Mountain Run 2014 is a go, repeat, Mountain Run 2014 is a go. 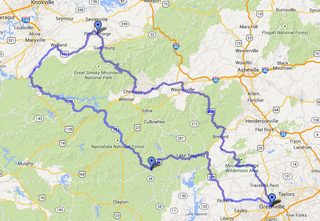 The current plan is to meet up in G-Ville/Travler's Rest Oct 23rd and spend 2-3 days driving through the mountains in the daytime and camping out during the nights. I think we should get Torchbuggy by then at take it along for a ride. To other oppos, if you're in the local area long the current estimated route, then feel free to say hi to the derp driving the silver NB Miata.